Thousands of mobile applications have been designed by developers all over the world for Android's open source platform. Although some apps have not yet been optimized for the large tablet screen, we are encouraged by the continued release of newer and better apps every day. Although the tablet came with 3 pre-installed app stores (Getjar, Appoke and, Soc.Io Mall), conditions beyond our control have caused some compatability issues. We now recommend the Amazon Appstore for obtaining the most current apps. Just click on the Amazon logo below. 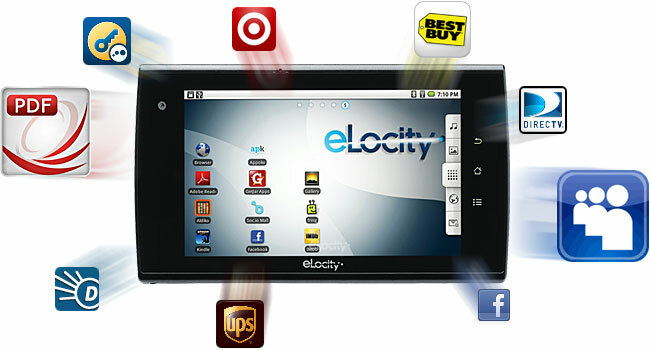 To get you off to a good start, eLocity is also pleased to offer you several FREE APPS that can be downloaded directly from our site.